Willie Mullins made it six Grade 1s for the week when Abbyssial carried the Florida Pearl colours to victory in the Grade 1 AES Champion Four-Year-Old Hurdle. The 15-2 chance had fallen on his latest start in the Triumph Hurdle at Cheltenham, giving Ruby Walsh a broken arm, but Willie Mullins' charge made amends for that in superb fashion with the same jockey in the plate. Abbyssial quickened up between the final two flights to get his rivals on the stretch and the race was all but over as they turned into the straight, with Plinth staying on for second place behind the six-and-a-half-length winner. Fox Norton finished third, with Triumph hero Tiger Roll a disappointing favourite. 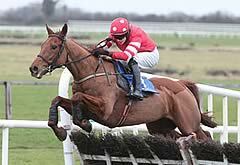 Owner Archie O’Leary added: “He looks very good hopefully will make a decent chaser next season. I told Ruby he stayed on board this time and got a rude reply! “When Ruby put pressure on the horse, he responded very well. I thought he acted very well on this ground.